Venture into the cosmos to establish a new Galactic British Empire. In the wake of political developments and the events that followed, Britain found itself increasingly isolated from global society. Frustrated by the demise of this once great nation, Her Majesty the Queen concluded that the elected representatives at Westminster were no longer fit to govern her United Kingdom. Establishing S.P.I.F.F.I.N.G. 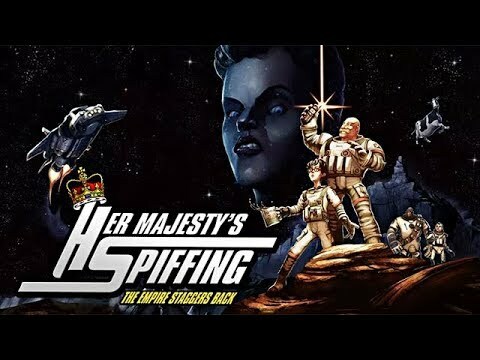 (Special Planetary Investigative Force For Inhabiting New Galaxies), Her Majesty has turned to the stars in a bid to establish a new Galactic British Empire. Assuming command of the near futuristic space ship HMSS Imperialise and her crew (distinguished veteran and gentleman Captain Frank Lee English and Aled, his mild-mannered South Walean colleague) you will venture into the cosmos, solving puzzles, engaging in witty banter, deal with crippling claustrophobia, gradually succumb to the sustained exposure of cosmic radiation and so on, all for Queen and Country.